Discussion in 'Provincial Nomination Program Immigration' started by Abdul2k10, Sep 13, 2018. Thanks, NOC 1311. 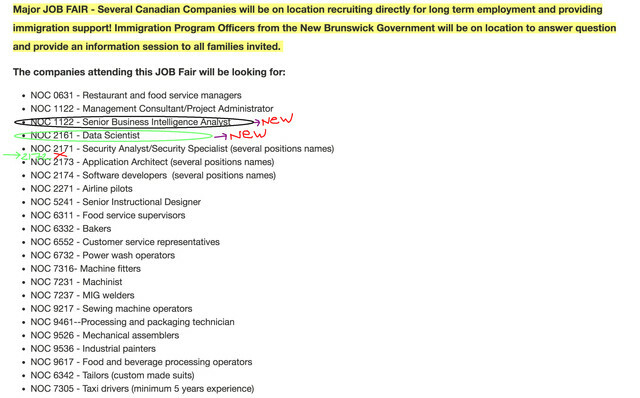 But i am confused about New Brunswick Express Entry session in Dubai on September 21st and 22nd. what are this two days for 21st and 22nd also do i need to attend these both days. Please let me know. Today Accidentally I discovered that NB have been made major changes at the list of NOC which is initially mentioned for job fair seminar during coming section for example the next one which will be hold in Dubai 21 September , for example i have registered with NOC 2172 which is Database Administrator, now this NOC no more exist, and they seems replaced with other related new NOC such data science, BI , and those new NOCs are very new and first time I seeing them!!! therefore I did not received even single email from them due to major changes in NOC lists for NB. Congratulations. Kindly post your invitation. It seems you are the only one who has got an invite. My NOC is also 1311. I'm waiting on my invite but I'm sure I'll get it by tomorrow.